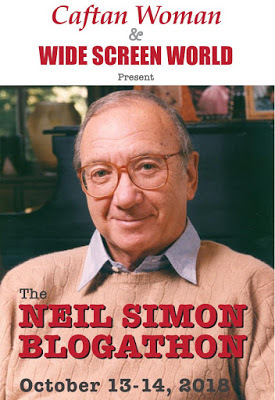 This is the second of 2 posts dedicated to The Neil Simon Blogathon being held over at Caftan Woman and Wide Screen World. Brief Synopsis – An alcoholic actress just out of rehab tries to get her life and career back on track with the help of her friends and her teenage daughter. My Take on it – This is a film that I heard about years ago, yet never got around to seeing what it was all about so I’m glad I chose to check it out fro this blogathon. Unfortunately, the story seems to be more suited for the stage than for the screen and seems to lose points by the way it is presented. Marsha Mason is fine in the lead but she is constantly outshone by her costars – James Coco, Kristy McNichol and Joan Hackett who are all better developed as characters. The story is told in a good way yet unfortunately, they never manage to endear us to the main character where the viewer can really care about what she has gone through and where she is headed for. As with all Niel Simon scrips (plays and movies) are filled with great dialogue and this film is no exception but something feels lacking that would have eventually made this film even better and more engaging than it actually is. Bottom Line – Interesting idea that probably works much better on a stage than on screen. Mason is fine in the lead but she is constantly overshadowed by Coco, McNichol and Hackett. The story is told pretty well but they don’t manage to endear us enough to the lead character to care so much about what she has gone through and where she is headed. The dialogue is great (as with all Simon scripted plays/films) but something still feels missing that would have made this an even better and more engaging story. Coco was nominated for a Razzie?! He’s my favourite thing about the movie. What is it with some people?